The southern part of India is generally very famous for its various spices and also for spicy foods. South Indian cuisine offers wide variety of trendy dishes and displays a wide range of both vegetarian and non vegetarian dishes. South India cuisine is the most popular and hottest of all Indian food. It is mainly rice based and is equally famous for the availability of coconut and wide variety of spices like cardamom, pepper, cinnamon, cloves and nutmeg. Cooking patterns in the southern states of India largely remains the same, but each state is famous for its own dishes. South Indian food is very spicy and is a brilliant combination of flavors, colors, fragrance, taste and nutritional balance. 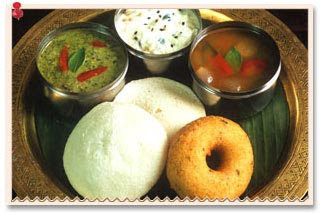 South Indian cuisine includes the following culinary schools- Karnataka, Kerala, Tamil Nadu, and Andhra Pradesh. The cuisine of Karnataka includes both vegetarian and non vegetarian cuisines. The cuisine of Karnataka is greatly influenced by other neighboring states as well as Maharashtra to its North. The cuisine of Karnataka includes Kodagu, Udupi, Manglorean, Malenad as its parts. Karnataka cuisine comprises of some of the typical dishes like Bisi bele path, Jolada rotti, Chapathi, Raagi rotti, Kesari bath, and uppittu. Whereas Coastal Karnataka is famous for its dishes like pork curries and tasty, nutritional seafoods. 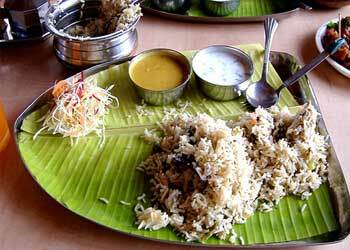 The Northern Karnataka is famous for its tasty dishes like Jola and rice. The popular hill station of Karnataka, Coorg has its exceptional cuisine having spicy meat curries of Chicken, Pork and Mutton. Karnataka is chiefly famed for its sweets like Mysore Pak, holige, and variety of Payasa. Kerala another significant state of South India with fish and steaming rice as the staple food. Kerala is well known for its traditional sadhyas, a vegetarian meal including boiled rice and variety of side dishes which is especially served during special occasions and festivals. The sadhya is complemented by payasam which is usually served on a banana leaf. 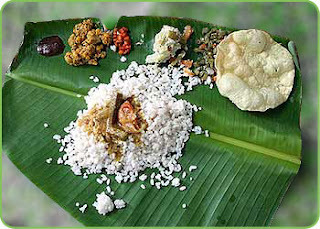 The culinary skills of different communities of Kerala make the dishes distinct in taste and variety. Almost all dishes of Kerala have a rich blend of spices and coconut added to it. Historically, Kerala is a part of Tamil speaking area, so the Tamilian influence can be clearly noted in some of the Kerala dishes like Sambhar, idli and in dosa. Tamil Nadu, the diverse state of South India holds the belief that serving food to others is a service to humanity. The Tamil Nadu cuisine involves both traditional vegetarian and non vegetarian dishes. Chettinad cuisine is very popular and special in Tamil Nadu and it is one of the spiciest and aromatic cusines of India. Some of the popular dishes in Chettinad are varuval, kuzambu, poriyal. Filter coffee, strongly brewed Tea are famous in Tamil Nadu. Tamil Nadu provides the visitor with a wide variety of dishes including both vegetarian and non vegetarian. Generally lunch or meals composed of cooked rice served along with series of vegetable dishes, sambar, chutneys, rasam and chutneys. The non vegetarian lunch includes curries or dishes cooked with mutton, chicken or fish. Andhra Pradesh is very famous for its hot and spicy cuisine which is largely vegetarian but the coastal areas have a large collection of seafood. Rice is the majorly consumed staple food that is consumed in large quantities in the state. Hyderabadi cusine is a famous section of Andhra cusine that offers the Nawabi royal recipes. The traditional Andhra dishes are absolutely mouthwatering and are served on a banana leaf. The Hyderabadi food is famous for its rich and aromatic nature. Andhra is very famous for its sweets and savouries especially made during festive and auspicious occasions. In Andhra Pradesh, each meal is served along with curd.